From a small office in downtown Mumbai to an imposing steel-and-glass building overlooking the city’s Bandra-Kurla Complex financial hub, Rashesh Shah, 55, has come a long way. 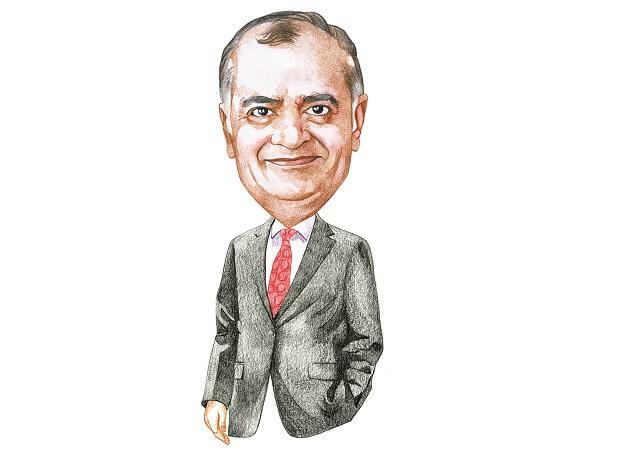 Shah, armed with an MBA from India’s top business school and expertise gleaned from his time at one of the nation’s largest banks, partnered with a colleague in 1995 to set up Edelweiss Financial Services. Named after the Alpine flower that grows in harsh terrain, the firm took root in the stock market and blossomed into a $1 billion group built around credit, insurance, and wealth management. But it’s Edelweiss’s status as India’s top buyer of bad loans that’s attracted funds such as Caisse de Dépôt et Placement du Québec. Since a national crisis sparked by last year’s near-collapse of Infrastructure Leasing & Financial Services Ltd., Edelweiss has tripled its liquidity, awaiting opportunities, Shah told Bloomberg Markets in an interview, a lightly edited version of which appears here. Shah, a recreational triathlete, says running a business is like running a marathon: Maintain a measured pace and resist the urge to start too fast. “You need to run one kilometer 42 times, not all at once,” he says. My father ran a business making stationery products, exercise books, diaries—a very small-time business. Getting a loan from the bank or a small overdraft was so much trouble. I saw that part, and I said it’s not worth it. I wanted to do something classier. I went to the Indian Institute of Management and got an MBA. Straight out of college in 1989, I started investing in equities in a small way. The petrochemical cycle had been going down for two, three years. I did a lot of research and came to the conclusion that prices were going up. I bought a lot of Indian Petrochemicals Corp. Ltd. and in one year more than quadrupled the money. The other was Tata Motors in 1993, called Telco at the time. Same thing. They had a huge inventory, as it was a recession in India. I knew interest costs were very high, and their inventory was falling every month. I calculated that just the falling inventory interest savings [would mean] their profit would double from the year before. So I bought that. Then again, there have been a lot of bets that went wrong. So you never bet the house on one trade. If you back it up with analysis and a good hypothesis, then your probability of being right goes up. But the probability is never 100 percent. Have a view, have a hypothesis, and then make an affordable bet. After graduation from IIM, Shah went to work briefly for Prime Securities Ltd. in Mumbai and moved on to ICICI Bank, one of India’s largest lenders. I learned two things at ICICI. One was analyzing companies, projects, profitability, and profit drivers. It was the best job; as an analyst, you can analyze a lot! The other thing—which in hindsight has been more important—was the ability to understand and appreciate the qualities of an entrepreneur. The main quality determining whether any project is successful or not is the entrepreneur. I was in the export group of ICICI. We had all the new-age entrepreneurs [as clients]: Infosys, United Phosphorus, Bharat Forge. They were all expanding exports at that time. They had to scale up their competencies and governance to compete on the world stage. Working with a company like Infosys taught me a lot. When Shah co-founded Edelweiss with Venkatchalam Ramaswamy, a colleague from ICICI, they wanted an iconic name, like Apple. They settled on a flower known for its hardiness. I quit my job with ICICI in May 1995. I had savings of 30 lakh [Rs 3 million, $95,600 at the exchange rate at the time], and by mortgaging our house I put in another 20 lakh. The rest came from Venkat and other investors. I promised my parents we would never lose money. We haven’t lost money in any of the last 22 years. When we started the business, [Infosys co-founder] Narayana Murthy told me, “Don’t build a business; build an organization.” That has always stayed with me. Your organization is like your soul. Most of the large financial-services groups were founded by big business groups in India. They had access to capital, equity, debt. We came without anything. So I said we ought to be very careful with the capital. For the first five years we gave ourselves a salary of only 3 lakh; we could have gotten more than 25 lakh in the market. We were the first to do employee stock options in financial services. This was unheard of in India outside of software companies. It has helped us in creating this culture of partnership. When we started the bad-loan business, we said, “OK, we will give it four or five years. We’ll spend about 20 crores [200 million rupees] over four or five years—about 4 or 5 crores a year as operating costs. That’s our investment.” Today, that business makes a profit of 400 crores a year. You have to take the profit and invest it back in the business, building scale in capability and competency. Every year, whatever profit we make, about 20 percent has to be invested back in the business, either trying out new businesses or new products. We are truly long-term. We used all this upheaval [in the Indian economy] as countercyclical opportunities. In 2008, 2009, when the markets were bad, we started our ARC [asset reconstruction] business. Our entries into asset and wealth management were made in similar environments. The key is being countercyclical because in India things are available when everybody is giving up hope. In our ARC we hired people in 2009, when the world was on fire. We went from four people in 2009 to 40 people by 2012. We look at challenging times as a great opportunity because we think the long-term trend in India is still up. As for risk management, we always ask ourselves only two questions: Is it worth it? Can we afford it? There is no USP [unique selling point] in financial services. It’s a really strange thing. It’s ultimately a commoditized market. If you look at a credit card of one bank vs. other banks, a savings bank account of one bank vs. another, or maybe a mutual fund of one manager vs. another, the parameters will be very similar. The two areas where you can make a difference are at a customer experience level and with the organization’s culture. The other strength we have is that we are diversified. We are a nonbank lender; we have a housing finance company; we have a capital markets business; we have an asset management business, wealth management, ARC, and brokerage and so on. We experiment a lot. So when the experiment works, it looks very smart. But there are a lot of failures. A good photographer takes a hundred pictures, right? And he throws away 99. But the one that is left is fabulous. But we don’t think of the failed ones. India is on a very good long-term trend. But it’s highly volatile. Now, you can either say volatility is a problem or an opportunity. I think we look at it as an opportunity. But you need to be confident of the long-term assessment. So when we acquired JPMorgan AMC [JPMorgan Chase & Co.’s onshore mutual fund business] in 2016, we said OK, maybe it will scale up in one year, maybe it will scale up in three years. That’s OK because of the price at which we are buying we can have holding power. It scaled up very well. In India, household wealth is going to grow, and you will need advisers and wealth managers. It’s happening in every other country. Why not in India? It’s early days for private credit in India. But then I would say that 20 years ago, private equity was also very small. Over 10 years, things evolve a lot. Everything currently looks very small and raw. The [liquidity] crisis that happened in the last quarter [of 2018] I think is a turning point. India is a very self-correcting country. Look at what has happened in the credit market: the bankruptcies, the way credit is evolving, nonperforming loans. The bad-loan crisis we had has resulted in a new insolvency and bankruptcy code, which has brought in a big change in the credit market. The recent upheaval will also bring a lot more focus on ALM [asset-liability management], liquidity management, governance structure for NBFCs [nonbanking financial companies], and so on. Credit research needs to improve if you want to have diversified providers of credit—banks, mutual funds, bond markets, insurance companies, foreign players, NBFCs, private credit funds. We are where the U.S. credit market was a few decades back. The need for India in the next 10 years is to reform the credit market. The cost of funding will come down; growth will get a big boost. Over the next year or so, [India’s] growth rate may come down due to the crisis at nonbank lenders. People will focus more on liquidity liability, and a lot of people are unhappy about that. When I say India is always a drama, it’s because we are a vibrant young country. Just like an adolescent. They have mood swings. We have a population that loves drama. This is the big thing about India. Our nominal GDP for the last 20 years has grown at 13 to 14 percent [a year]. Growth in financial services is about 4 to 5 percentage points higher than that. That means you are doubling every four years. The economy is getting more financialized. We call this India’s golden age of compounding. I’m very confident that 10, 20, 30 years down the line, India will be calmer. You see, everything can’t be drama.